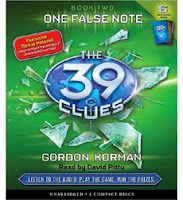 I've discovered a new joy: the audio recordings of Scholastic's 39 Clues series. I've only listened to the first two so far, but I am finding them extremely enjoyable. The 39 Clues are super popular at my library. We can hardly keep them on the shelves! And, though I don't generally care for series or mysteries (heh), I felt I should give them a shot. I'm so glad I picked up the audiobooks because I really enjoyed them! Each book is written by a different, big-name children's author and the first book in the series is The Maze of Bones by Rick Riordan. When orphaned Dan and Amy Cahill's beloved grandmother dies, they've lost the last blood relative who really cared about them. 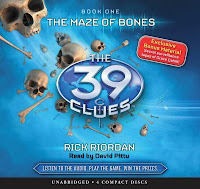 And they're also thrown into a deadly scavenger hunt, The 39 Clues. Members of the enormous Cahill family can choose to receive a million-dollar inheritance or the chance to solve the 39 Clues and inherit the power and fortune that the Cahills have built up over hundreds of years. Dan and Amy choose the clue and thus begins their whirlwind journey. The Maze of Bones takes Dan and Amy to Paris and their journey continues in One False Note by Gordon Korman. One False Note sees Dan and Amy off to Vienna to continue the hunt for clues. The deck is stacked against them with a dozen or so wily and unscrupulous relatives trying to beat them to the next clue. Now, when I tell you that these books include information about such famous figures as Ben Franklin and Wolfgang Amadeus Mozart, I don't want you to think that they are boring. In fact, the action is pretty much nonstop. Yet, as I listened to Dan and Amy's antics, I found myself intrigued by what I was learning. I'd venture to say that some kids will really dig that and may be inspired to check out some nonfiction books to learn more. In fact, it might not be a bad idea to pair The Maze of Bones with a travel guide to Paris and a biography of Ben Franklin. So, all that's about the text. Let's talk about the narration. Um, it's awesome. David Pittu gives a full-voiced performance and the number of accents he includes is impressive. These would make great family listens for road trips with the lively narration and the fast-paced plots keeping the interest of everyone in the car. Full disclosure: copies provided by my local library. Hey! I'm an Audible affiliate, so if you make a purchase after clicking on affiliate links on my site, I will receive a referral fee.